The Fellowship was fortunate enough to obtain a copy of VITRIOL THE HUNTER #2 from IDW Publishing. The story is written by Billy Martin and Brent Allen with pencils by Martin, inks by John Wycough, colors by Jeremy Treece, and lettering by Robbie Robbins. Despite a valiant effort on Vitriol’s part, Korbius’ minions steal the serum that can turn humans into werewolves. Korbius deliver the case of serum to Lord Barthus, but informs him that Vitriol is still alive. Our hero returns home and has his wounds tended to by Danion, who questions why he doesn’t join forces with the Defense Initiative. The conversation is interrupted by a press conference on the TV being held by Mayor Dyer. It’s announced that recently kidnapped scientist Dr. Grethius has been rescued. The scientist gives a message of gloom, and then ends the conference in the most unexpected way! The writing is solid, but the plot is not all that unique. That’s not to say it isn’t good or an uninteresting series. The main character is what has intrigued me. He’s fighting the creatures of the night as a repayment for his father’s sins, but there is more to this mysterious man than that. This is a book worth checking out. 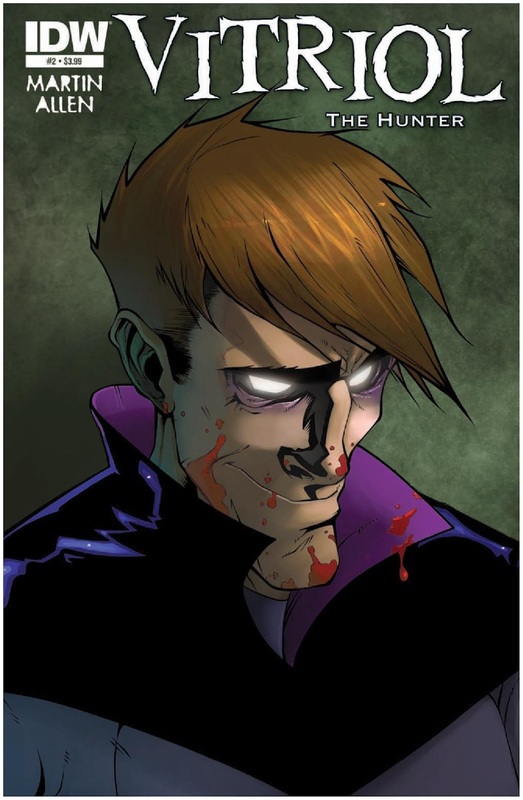 VITRIOL THE HUNTER #2 is in stores now or available at www.idwpublishing.com.